If you are going to enjoy your outdoor space in the cooler nights of fall, the Outdoor Fireplace Chimineas will work. We are going to look at five examples of metal chimineas that will be very different, you can even cook on or some use as an oven. All are made of either cast aluminum or recycled copper, they will not rust. Lets take a look at these and then you can give me some feedback. The body of this Chiminea is made from cast aluminum to prevent rust, the bottom grate and grill insert are made of cast iron. To keep the sparks in, it will have a hinged door spark screen and spark arrestor in the neck area. You can order in three colors, Antique Green, Charcoal and Gold Accent. 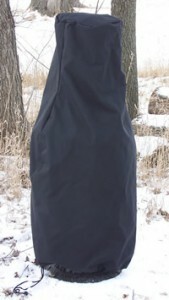 The neck can be removed so that you can grill your favorite food for your outdoor guest. If you are like me and want to cook hot dogs and roast marshmallows, all you have to do is open the door and get your favorite grilling stick. The Chiminea is 54 inches tall and 22 inches across. Perfect size for a patio area close to the house. It will weigh 50 pounds and will hold a regular size log (16 inches long) in the burn area. This medium sized chiminea will handle many chores for your outdoor comfort. You can use it for heat, cook on it like a grill or use it as an oven for bread or pizza. The body is made from cast aluminum with cast iron bottom grate and grill insert. The single hinged door has a spark screen to keep embers inside. Has a decorative rain lid when in storage. The top half can be removed for grilling. It has a door that will open on the bottom to help with removing ashes. Can you imagine sitting around your chiminea and waiting for your oven fired pizza to be done. This and your favorite beverage will make your outdoor activity the talk at work on Mondays. Your chiminea will be 44 inches tall and 22 inches across. The weight is 68 pounds, a little on the heavy side to carry. This larger chiminea has a burning sun on the stack and sun rays coming out of the burn opening. Made of cast aluminum alloy with cast iron bottom grate and grill insert. The top stack comes off to use it as a grill. There is a rain cap to use on the top when not in use to prolong the life of your chiminea. Has extra wide opening for fire viewing or open the door to roast marshmallows. Has a hinged door with fire screen and a fire arrestor in the neck area for fire safety. The large door opening will allow the use of a regular size fire log. This chiminea will be 54 inches tall and 22 inches across. It is much larger at 80 pounds, may need two people to move to another area, not very portable. A little different in design, almost a fire pit, this chiminea has a deep bowl to hold severa logs at one time. Lift off the top and you will find a chrome plated cooking grate to either set your iron skillet on or cook your favorite meat. The main body is made from 100 % recycled copper, the legs and support is made from wrought iron. Has 360 degree viewing of the fire with a 15 inch tall screen. The chiminea is 36 inches tall and 24 inches across. At under 60 pounds, it is light enough to move around or take with you to tailgate at your favorite game, just don't load into the back of the truck until cool if you want to ride home. The Elite Chiminea is made from cast iron with a antique bronze powder coated finish, that will last a long time and will be fade , chip and crack resistant. The fire screen and door will allow 360 degrees of fire viewing. Some assembly will be required, as this is not one piece. Use the supplied Stainless steel or brass hardware. When assembled it is 34 1/2 inches tall and 15 inches across. At 30 pounds it is very portable. Many of these chimineas can be converted to propane or nature gas use, just install a Gas Conversion Kit. If you do not plan on moving your chiminea and have access to a gas supply, this can give you a smoke and ash free fire. Without having to haul wood or clean out ashes at the end of your fire, this will make cleanup a snap. It has easy to follow instructions for installation, with pictures to guide you. 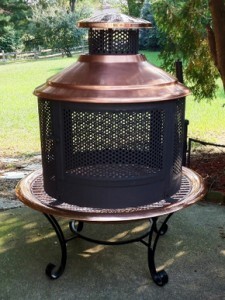 If your chiminea has to stored outside, a cover will help prolong the life of your fire pit. Available in many sizes to just fit your chiminea. Made from heavy reinforced vinyl material that is waterproof and weather resistant. Drawstring and toggle closure will make for secure fit. I have reviewed the DeckProtect system in another post. Read about it here. It will protect if you are using your chiminea outdoor fireplace on a deck made of wood or a composite material. If you want to protect any other area from the heat and debris of your fire pit, a regular fire pit pad will work. When looking for Outdoor Fireplace Chimineas for your outdoor space, several options are available. When you find the size and shape that you desire, your choice will be easy. Make sure that after you have set up your fire pit that you have a good place to store your wood. If you choose to have a gas conversion, you will not need any other storage or cleanup. If you have any questions or comments please use the form below. I just finished putting down patio bricks, and I was looking for a outdoor fireplace chimineas. I’m glad I found this page! It’s so hard to decide which one to get. I love the Sun Stack Outdoor Fireplace, and the blue rooster garden outdoor fireplace. I like the fact that you can cook on it. I think this is the one I will get. How long does it take to cook a pizza? It will depend on the wood that you use to burn. Some woods like oak and ash are a lot hotter than some of the other woods. I would suspect it would not take over ten minutes to cook a small pizza. The taste of your pizza will be a little different, more like that of a stone oven. It will make you think that you just paid $30 for your pizza. The outdoor chimiineas will add charm and heat to your outdoor space. They make a great conversation area during the cool months that are coming up. Wow you sure do know your stuff. Every paragraph of this post was easy to understand and full of useful information anyone would be interested in when trying to purchase a chiminea. One thing I noticed on your site is that your categories section is a drop down menu. Personally, I think you have so many categories, maybe making those categories visible on your page instead of in the menu would get more people reading your posts. Best wishes! Thanks for the comments and suggestions. I will look into the changes that you suggested. I love this site! I had one of these when I was in Europe but it was the clay kind. It was nice but not near as nice as the ones you have pictured here. If I had room for it, and my children were older I would definitely get another one. They look really nice on the patio and produce enough heat to keep you cozy while entertaining. I use to sit outside at night while snuggled under a blanket in my rocker and read my books. I just love them. I am also loving the covers that you have here. I didn’t have one of those. But that would have been a very nice addition to have. I will definitely add this site to my favorites so I can come back here and check it out again when I can order one. My favorite is the Sun Stack. Thanks for the comments. The Metal Chimineas are a little better than the clay ones. You can take the top off and use as a grill. 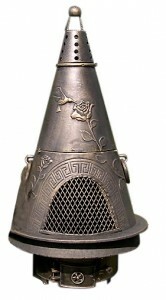 The garden Chiminea can be used to bake bread or pizza. The 360 degrees of heat on some of these will make them out heat a clay one. Really nice, you really know your stuff, I checked your page and its looking good, also your site and I willl be coming back, to see your latest posts, keep up the good work and remember that the content is the best you can make for people to find your website just like I did. Thanks for the comments Danny. Totally brilliant idea, an outdoor chimnea that doubles up as a barbecue grill. Makes the investment more worth while as you can use the barbecue in the summer and prolong those summer nights way into autumn and enjoy more barbecues with friends well into autumn and keep everyone warm with the radiant heat of the fire..brilliant! Having something that has more than one purpose will make it get used more. I like that you can cook a pizza in a chimenea. You can sit out on the patio cook a pizza and have some of your favorite adult beverage with your friends when there is a little chill in the air. Thanks for your comments, I will look forward to hearing from you in the future when you receive my new post.